Brought up in London’s East End, by the 1960s, Ron Clover, was a partner in a successful engineering business. It was the time both Clover, and his partner, Brown, flirted with the new Italian-bodied Jensen. In fact both partners bought Interceptors and FFs. London, in the 1960s, was an exciting place to be, and could be quite wild. Ron Clover tells the Museum about his Jensen days in 1960s / 1970s London. With a wry smile, Clover jokes that he doesn’t know if this feature is Recollections of a Jensen owner, or Confessions of a Jensen owner. By the mid-1960s, Clover Brown Engineering was at the top of its game. The company specialised in the manufacture of pipework. Ron Clover had been a senior draughtsman with a pipework fabrication and installation company. Later he was given the opportunity to re-organise the company, and during his time undertaking the company re-organisation, Clover had met Harry Brown, who was employed as a site erection foreman with the same company. Agreeing to start a company specialising in pipework and general engineering, they both left their employment, and started their business in 1961, with a factory in Romford, then Stratford in east London. It quickly took off, and within the first year they were employing fifty people, and by the second year, a hundred people. By 1963 they opened a new branch in Kings Lynn. 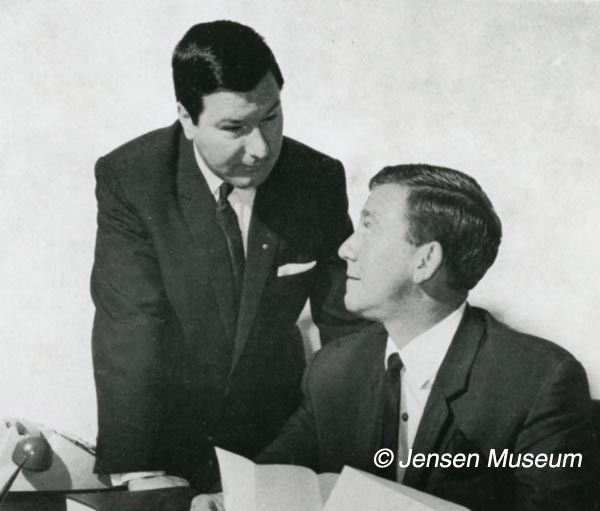 Ron Clover (standing), and Harry Brown, 1960s. A large variety of contracts came into Clover Brown, with many household names using the engineering company for routine maintenance, through to the installing of completely new production lines. Such names included, Mars, British Sugar Corporation, Smedleys, and Birds Eye. By 1970, the Company was turning over in excess of £1000,000 annually. Riding high, Clover Brown started to break into other sectors, including the setting up of a Fire Protection Division, and a Building Division. In fact no sooner as the Building Division had been set up, they won a lucrative contract with the Greater London Council, undertaking building work on the then new Thurrock Estate. Always ready to think outside the box, Clover Brown became the first company to have one of their especially manufactured tanks airlifted by helicopter onto the roofs of the Green King brewery in Bury St.Edmunds. The tank, weighing in at well over a ton was going to be used for storing oil for the malting kilns (also manufactured by Clover Brown). The oil tank was taken up under one of Bristow’s helicopters, and carefully deposited on a secondary roof between two higher roof levels. One of Bristow’s top pilots made sure there wasn’t any messy mistake with dropping the tank into position. 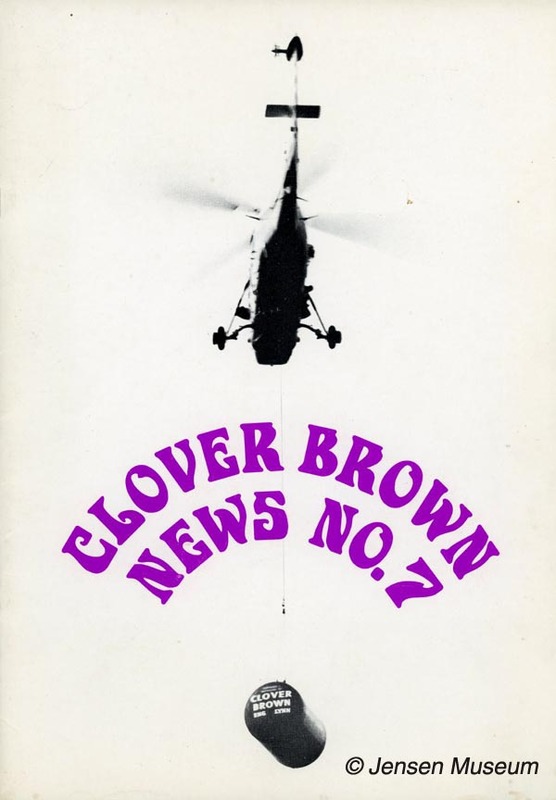 One of the monthly newsletters (dating from the late 1960s) distributed throughout Clover Brown Engineering. The front cover shows the Bristow helicopter air-lifting the oil tank. Another ambitious contract Clover Brown took on, was the installation of approximately one miles worth of 8″ pipe at London (Heathrow) Airport. 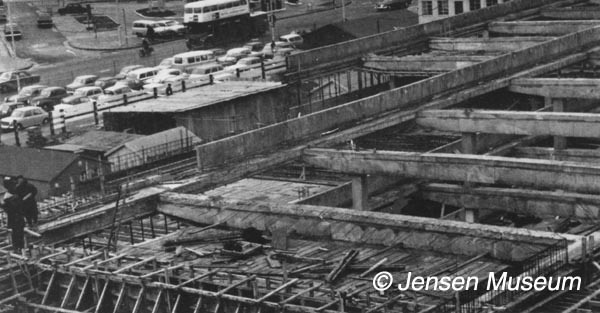 The pipe work was destined to carry steam and hot water from the main airport boiler house, through to the new South West Terminal, and pier 7, in readiness for the arrival of the first 747 Jumbo Jet. It was a particularly complicated job, requiring the feeding of long lengths of pipework into very small tunnels. Due to possibilities of expansion, and also excessive pressure, large compensators had to be installed, along with other cutting edge pipework technology. 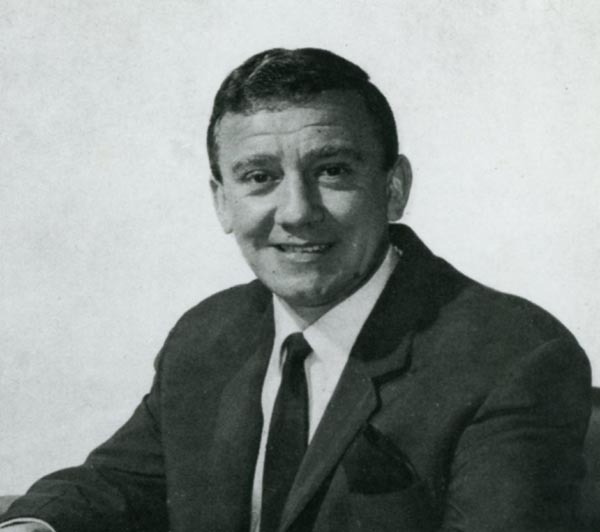 So for Ron Clover, and Harry Brown, serious money was coming in by the middle 1960s. This would translate into nice houses, and prestige cars. Both men were buying Jaguars by then. Two at a time. Clover and Brown would pop along to Henleys at Finchley, and buy their cars together. Clover was getting through a series of Jaguar MK.Xs on a regular basis, later changing to a Jaguar ‘S’ Type. His flamboyant partner, Harry Brown, was also changing Jaguars on a regular basis, and was currently enjoying the Jaguar E-Type. Clover had been taken by the new Jensen Interceptor, after seeing it unveiled at the Motor Show in 1966. That space-ship shape certainly put the new Jensen on his ‘hit’ list. As to Brown, well, the new Jensen ticked all the boxes. The car epitomised a look and a life style, and both Clover and Brown could afford both. “After the salesman, Nigel Bligh, had talked us through the instrumentation, off we went in our new Jensens, back through the centre of London over to the east end. Our premises at Stratford had a fairly narrow parking area down one side of the factory, and that’s where Harry and myself parked our cars. “One evening a group of us went off for a dinner at an Italian restaurant we frequented. There was myself with my wife, along with Harry and his, and some of our friends. It was a good evening, and Harry had picked a good quality wine. Not long after, another bottle of wine was opened. Then the waiter was back asking Harry if he would like another. Of course, Harry had fallen behind on how quickly we were all getting through the bottles, no one was being cheated. But, the poor waiter was really getting a mouthful. The waiter rushed off to get the owner. Gino, the owner came over to Harry, “I believe you think you have been cheated over a bottle of wine. This is our very best wine, please have it on the house”. With that Gino moved the bottle in front of Harry’s eyes so he could read the label, “will that be okay for you”, Harry, having calmed down, thanked Gino, saying that would be fine. Clover didn’t realise, but both Charles Follett, and Jensen Motors, liked the ‘mango’ colour. 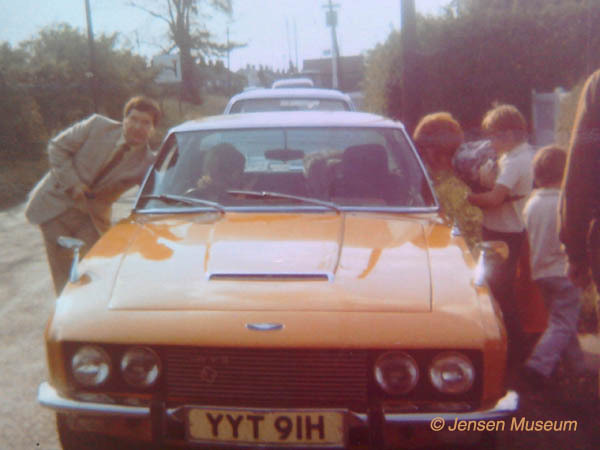 In fact Jensen Motors added the colour to their range in 1970, even using the ‘mango’ name. Two further Jensen FF cars were sprayed in mango, along with a handful of Interceptors. 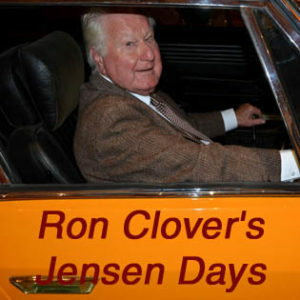 Clover never did realise his ‘unique’ colour formulation had been added to the Jensen range until the matter was discussed with Museum curator, Ulric Woodhams, in 2016. Clover standing next to his mango Jensen. Photograph taken in 1970. When the completed Jensen was transported down to Charles Follett, to be made ready for collection by Brown, Pat Follett took a liking to the unique magenta colour. He contacted Jensen Motors asking for a demonstrator car to be painted in the same magenta colour. Somehow, Harry Brown heard about this, and was extremely displeased. An abrupt and formal letter was sent to Patt Follett, stating in no uncertain terms, “you use my magenta colour, and I’ll never buy another car from you again”. Follett immediately cancelled the order for a demonstrator in magenta. The two heads of Clover Brown Engineering were concidered important clients for Follett, and Pat Follett quickly realised it wasn’t going to be worth creating an issue over a single paint colour – particularly with the inflammatory nature of Harry Brown. Clover resumes his story, “Back in 1963 we had opened another factory over in Kings Lynn near Norwich. It wasn’t just by some chance we opened the factory. Clover Brown Engineering had won a couple of large contracts over towards Kings Lynn, so opening a factory there made sense. Harry or myself had to make the journey from Stratford to Kings Lynn on a fairly regular basis, and on the odd occasion we had to go together. Now Harry had this thing about beating everyone on the road, on one occasion we needed to go in separate cars. So there we were leaving Stratford in our FFs, Harry in his magenta magnificence, and me in my mango marvel. We started off following each other, until we were on the open roads, then typically Harry put his foot to the floor, and was away in the distance. Now I’ve always considered myself a fairly safe kind of driver, but the funny thing was, I reached our Kings Lynn factory just before Harry. He was not amused, and kept on asking which way I went, trying to understand how old ‘safe Ron’ could have beat him. To this day, I don’t know how I beat him, but I still have a chuckle about it when it comes to mind. One thing to be said, is I would always try and be in my own car, rather than go with Harry. To give an idea why, there was another occasion when the two of us went to the Kings Lynn factory in Harry’s FF. Once we were out of ‘The Smoke’, Harry put his foot to the floor, and we were propelled at huge speed towards Kings Lynn. That’s until we ended up in a horrible traffic jam. Sitting in the jam for what wasn’t a long time, I was aware that Harry was getting irritated. Next thing, he pull’s the FF out to the other side of the road and puts his foot down against the on-coming traffic. Petrified, I watched as the on-coming traffic pushed itself over onto the pavement the other side of the road, whilst he hurtled passed the stationary cars on his side of the road. Luckily he got away with it, squeezing back in at the snarled up junction which was causing the jam. 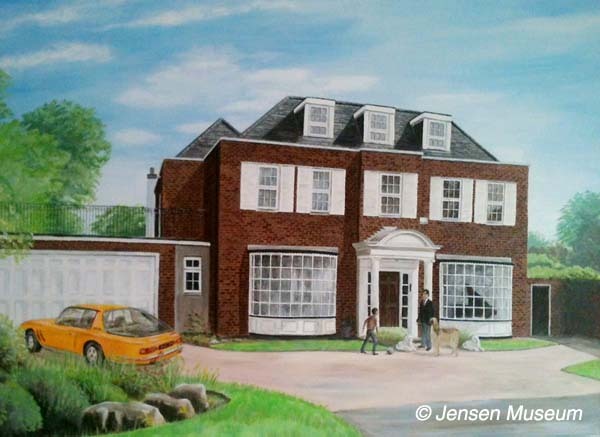 Clover’s son, David, commissioned this painting, showing Ron Clover’s mango Jensen FF outside his house in Chigwell. Both Ron Clover and Harry Brown, were living in Chigwell by 1970. Clover would often go out socially with Colin Wines, and with his mango Jensen back and cleaned up, he agreed to go out with Wines for a drink. “So, I was going out for a drink with Colin. Late in that evening; or should I say early in the morning of the next day; we were driving through Hackney in my mango Jensen, on our way home. Colin spots a couple of birds on their own, “Ron, stop and reverse, lets chat-up those girls.” I thought, oh ! no ! here we go again. I stamped on the brakes, came to a brisk halt, and reversed the Jensen back towards the girls.”Hello girls”, starts Colin. “Can we give you a lift home”. Perhaps they couldn’t resist my gorgeous mango coloured Jensen, or was it Colin’s charm, who knows. Next thing, the doors are open, and the two girls are climbing into the back. Typically one was a stunner, and the other was a bit of a dragon, and even more typically, Colin is straight in chatting away to the stunner, whilst I’m focused on driving and taking directions from the dragon. They didn’t live that far away, and I’m told to stop just ahead by this block of flats. I suppose you two want to come up for a coffee, the stunner states, and with that we are all climbing up the stairs until we get to their flat. So there we are, in the living room, drinks come out (and no it wasn’t coffee), Colin is sitting next to the stunner, and it didn’t take long before they shuffle off to a bedroom. Well, I’m not up for it with the dragon, so there we are chatting away in the living room. Some time later, Colin re-appears, and with some goodbyes, off we go. Now you’re probably thinking this is all a bit boring so far, but bear with me, this story isn’t finished. So, about a week later, Colin gives me a call, he has arranged to see this bird again, but wants me to look after the dragon. He’s arranged that we go over to her place late that evening. I’m not enthusiastic, but Colin has this way of bending you round. Must be the ‘car dealer’ in him. So, that evening I pick Colin up in the mango. Yes, I mean the Jensen. I always called it the mango. Off we go to Hackney. I park the mango up at the foot of the flats and off we go up the stairs. Once there, Colin rings the bell, and the door opens. There’s the stunner, but this time with a shiner, you know, a bit of a black eye. This is not a good sign, but anyway, Colin is already through the door cracking jokes about her falling over, so I follow. We’re led into the living room again, but this time the dragon isn’t there. This enormous bloke is waiting, complete with crow bar in hand. We’re told to sit down, and we obey. So the questioning starts, “which one of you have been mucking around with the girl”. This is not looking good, anyway the two of us try to make light of things. Obviously, we were just trying to help the girls, we just gave them a lift back home, and they offered to make us a coffee, that’s it. He didn’t seem convinced, but told us to sit where we were while he went and made a call. So, we’re sitting there like a pair of naughty school boys in front of the headmaster. The bloke disappeared to the hall, and makes a call, I get the jist that this minder was calling his boss, and it was quickly becoming clear that either Colin, or both of us were not going to come out of this with all teeth intact…, and that’s if we got off light. I whispered to Colin, we’re making a run for it. Just before the phone goes down, I’ll run at him and punch him as hard as I can. You get the door open. And that was it, just as the phone was going down, I was there, thumping him as hard as I could in the stomach. He buckled over, and I kicked him as hard I could where it would hurt. Colin was already out of the door, and I was following. It was a narrow escape, and once in the mango, we were driving back to Gants Hill, laughing nervously about the escape. Settling down, we both went quite, and all you could hear was the burble of the engine, and the flip-flop of the windscreen wipers clearing the screen of rain. Colin, turned round to me, “Ron, not being funny, but you know the mango marvel [Jensen] sticks out like a sore thumb, if anyone wanted to find you, how long do you think it would take”. It wasn’t what I wanted to hear, but the thought was also in my mind. Perhaps it was time for the mango to go. The next day I mentioned the escapade to my partner Harry, and said perhaps it was time for a car change. Apparently one of Harry’s neighbours, Raleigh Zilesnick had seen our FFs and taken a liking to them. He had mentioned that if either one of us were selling our car, he could be interested. So, I got Harry to mention that I was selling the mango, and the next minute Zilesnick was on the phone. £4,000 later, Zilesnick was the new owner of the mango marvel, and me, I went off and bought my first Rolls Royce. A nearly new one bought from our Colin. It was going to be a more sedate life for me. My Jensen days; as exciting as they were; had ended. And what about Harry. He was never going to change. He part-exchanged the FF for an even faster car, the new Jensen SP, or ‘Sure Puller’ as I knick-named it. REQUESTS: Did you own a Jensen car, if so, would you like to write your recollections of yourself and ownership of the car. It doesn’t matter if you do not have writing skills, we can help you with that. please contact us at archive@jensenmuseum.org, or telephone +1694-781354.